I fight back the tears that take form in my eyes. It’s been three months since we last fell asleep inside the confines of our camper. Three months since we drove the 5+ hours from our small town outside of Buffalo, NY and crammed into our small SUV –listening to Disney movies playing from the portable DVD player, handing back snacks and drinks, and stopping every so often to get gas, “go potty,” change diapers, and walk the dog. This past summer, we spent a combined 40 nights away from home camping as a family, although I suppose I should use the word “home” loosely. By the end of the summer, our children literally forgot that “home” existed outside of our 18-foot house on wheels. Of those nights spent “away from home,” nearly half of them were spent in the place where our souls feel the most welcomed. The place where time slows and sometimes seems to cease to exist; where loons sing you to sleep at night and the smell of pine from a morning breeze wakes you from your slumber. The place where mountains replace cell phone towers and bug spray replaces your usual perfume; where afternoon canoe rides and family hikes replace your usual 2:00 meetings; and star-gazing and late night bonfires replace your usual Netflix binges. For the better part of our summer, our souls called the Adirondacks “home.” We rested easy and adventured hard, feeling like we were exactly where we were meant to be. Something seems to happen every time we see that big wooden sign welcoming us in. The billboards stop, the speed limits slow, and we find ourselves scheming ways to move to the mountains for good. To leave our jobs, our physical home, our families, and everything we know and start fresh in the place that we crave the second we hit the road in the opposite direction. 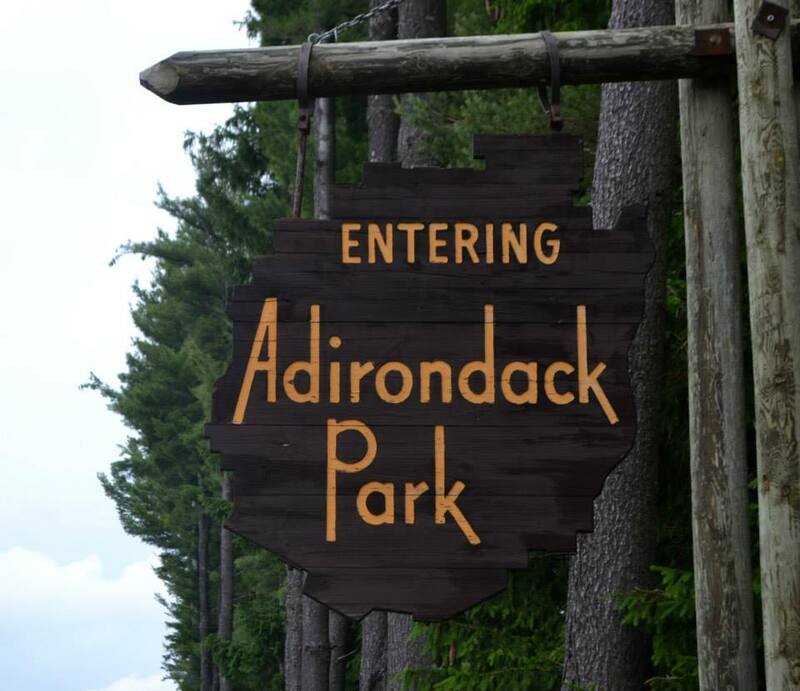 We enter the Adirondack Park and our spirits soar in the simplicity of it all. We look around and see our daughter, her fingernails dirty from digging in the dirt around the campsite; our son with his rosy cheeks freshly kissed by the fresh mountain air. The only sounds we hear are those of our children’s laughter, waves lapping up against the shoreline, and the occasional conversation with neighboring campers. Even our usually-hyper dog seems to relax in the great Adirondack outdoors. A sense of calm comes over us as we appreciate the beauty of getting back to basics – no threat of urgent emails in our inboxes, no need for the TV to entertain the kids while we clean our house, no distractions from the things that matter most in the world: just the four of us. Our blessings become especially abundant in the higher altitude. We spend hours searching through Adirondack Real Estate magazines and finding just enough of an internet connection to scroll through job boards by the glow of our lanterns, and we wonder… Would all of this lose its luster if it was a part of our daily routine? Would the call of a loon on the water ever not make us stop in our tracks? Would we start driving with the windows up and not breathe in the strong pine-scented air? Would we eventually stop camping, stop exploring, and stop carving out time in our days to hike to the top of a mountain together? Maybe one of these times we’ll actually commit to the change, pack a moving truck instead of just our camper, take the 5+ hour drive, make our dream a reality, and find out. Until then, we’ll stare longingly out our front window at “home” at our camper – empty and ready to withstand another cold and lonely Buffalo winter – and count down the days until our next family trip back to the ADK. Lovely…I too miss my Adirondack mountains! I was born and raised there,in beautiful Brant Lake…I now live in Montana…which is also heaven on earth,but my heart belongs to the Adirondacks! There’s just something so special about the ADK. Our camping "bucket list" is to visit all of the National Parks with a cross-country summer tour one of these years. We’ll definitely be hitting up Glacier in Montana and can’t wait to see the beauty in real life! Thanks for reading and for the comment. Happy holidays to you and yours! Just do it! I live in the foothills outside of Saratoga Springs and it NEVER gets old – do it while you are all still young enough to really appreciate everything. If my husband (technology teacher) could find a job and I could find a couple more freelance social media/communications clients for my at-home business, we’d be there in a heart beat! GORGEOUS pictures!! Looks like a fantastic trip! I have lived a good part of my life in the ADKs and do not live there now. However, when my time is up on this earth, I want to come "home" and spend eternity there, A nice place to visit and live, and even die. but a terrible place to try to make a living. The very things that make it so beautiful, also makes for no jobs. Also everyone I grew up with had to leave home to find work in places like Albany, Utica, Rome, or else where. The winters are brutal…….many of us have summer homes there but we go to Florida in the wintertime..
We are pretty lucky in our current situation in Buffalo, both with full time jobs (and mine that allows me to work primarily from home with our two children). For now, our dream to move to the Adirondacks remains just that — a dream. Maybe someday the stars (and jobs!) will align for us. Thanks for reading the post! Have a happy holiday season. This is so beautifully written. You spoke the sentiments of many of us who love the Adirondacks. My husband and I grew up around Glens Falls, NY. I had never been up the the Adks until we married. His grandparents and parents both camped at Rollins Pond campsite a state owned one behind Fish Creek. I had never camped before and fell in love with it. That was always where we spent out 1 week vacation with our two sons. Both of our sons and their children now camp there. This next summer we are hoping to take our 2 year old grest granddaughter there, that will make 6 generations to camp there. We lived in Lake Placid in 1968-1969, our second son was born there. My husband worked for a printing company and when it closed its doors we moved to Clifton Park, NY. We still take many trips to that area, last Feb. we stayed the weekend and saw the ice castle in Saranac Lake, took a dogsled ride on Mirror Lake. We are blessed with such beauty in the adks. but jobs are few and living is hard. But we will always return when we can. Thank you for writing such a beautiful article on our own "little bit of heaven".